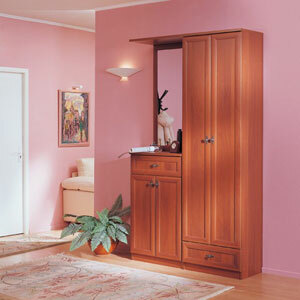 Shah Hallway System in Italian Chestnut Color. Top Shelf and telescoping hanging ring and one drawer. Smaller cabinet has one shelf. Comes ready to assemble. Other colors and styles available, scroll to the bottom of the page. Price Includes system as shown. Size: W47.2 In. H88 In. D15 In.